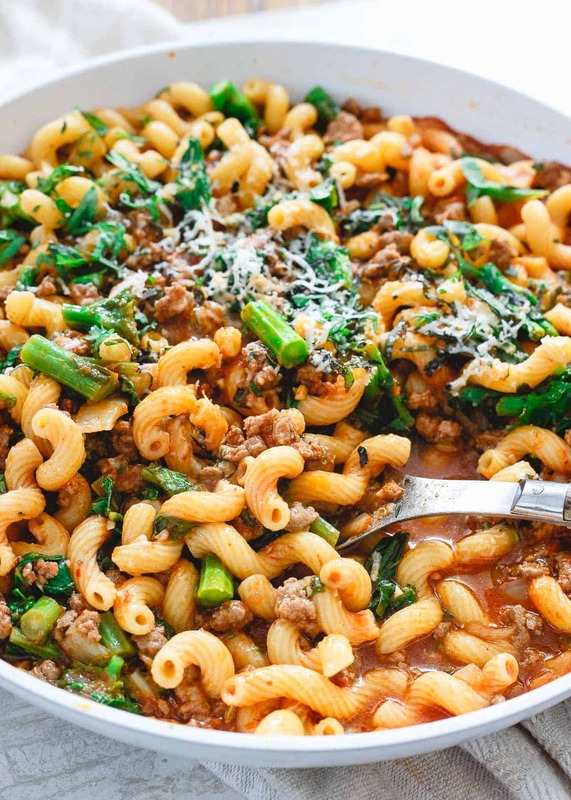 This lamb ragu is a spicy, spring inspired one-skillet dinner. Cavatappi pasta, crushed tomatoes and harissa paste make it flavorful and hearty. Oh spring? Where art thou??? As I write this, it’s supposed to start snowing any minute here. On the second day of spring nonetheless. It’ll be our 4th snowstorm in about 2 weeks and I’m pretty sure it will have (if it hasn’t already) snowed more in March than the entire rest of the winter. Needless to say, I’m over it. And that’s putting it lightly. Very lightly. *This post is in collaboration with the American Lamb Board. All content and opinions are my own. This lamb ragu is me channeling spring through food and pretending like it’s actually warming up outside. We just spend the last 3 days digging fence posts, installing wire fence in the woods (which really meant me just leaning against the 100 foot roll of 16 gauge metal wire so it didn’t fall on top of my husband while he painstakingly clipped the fence to the posts without gloves in 28 degree temps) so Holly can run around freely and I can actually get a full day of work in uninterrupted without having to drive to hiking trails every day to get her exercised. My fingers and toes were numb for about 15 minutes after coming inside and standing in a hot shower. The weather isn’t even close to spring-like right now. I figure if we just start eating like it’s spring, it’ll eventually happen though, right? In springs past I’ve made these smoky grilled apricot lamb kebabs, these skillet lamb chops with cipollini onions and these citrus braised lamb shanks but this year, in collaboration with the American Lamb Board, I wanted to keep it simple with this one-skillet meal. Let’s talk a little about American Lamb before we get into this recipe. If you’ve been to the grocery store you might’ve realized that almost all the lamb sold there is literally from the opposite side of the world. I’m not really down with that because it’s totally not necessary when American lamb is produced in so many states right here in the U.S.! If there’s an option to help support local farmers over those in Australia and New Zealand I really don’t know why we wouldn’t? I’ve actually had conversations with my local grocery store butchers and asked them to procure American lamb. In my opinion it tastes better (think lamb is too gamey/earthy? Try American lamb – I’d bet you might change your mind) and it hasn’t had to travel tens of thousands of miles to get to the shelf for purchase! Don’t miss these lamb spring gyros either – one of my all-time faves from the past! While lamb shanks, chops and kebab cuts can definitely be found on occasion or at least ordered with your butcher, they’re a little more rare than the always present ground lamb in the store. 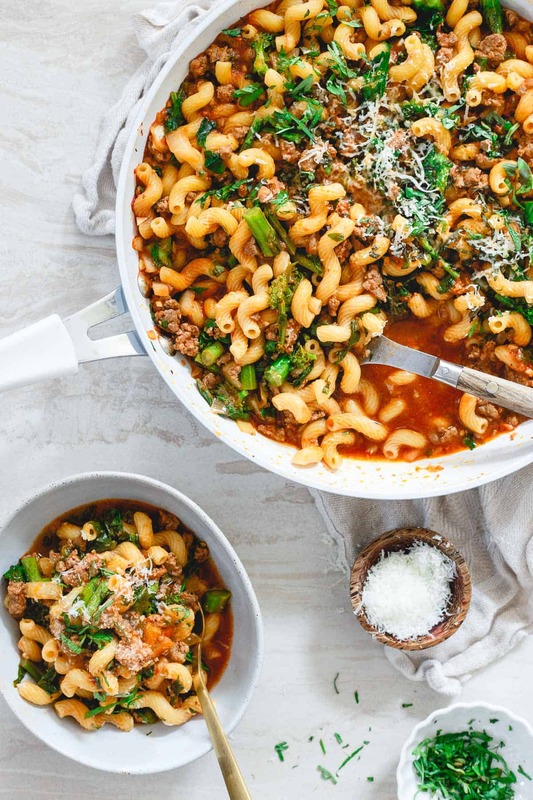 With a pound of American ground lamb and a bunch of stuff probably already in your pantry, this spicy skillet lamb ragu comes together in less than 30 minutes making it an easy weeknight meal. I love the broccoli rabe addition for some greenery (no need for a veg on the side) and fresh spring punch but feel free to use any green vegetable here. Regular broccoli would work well, spinach, kale, swiss chard or asparagus even. Cavatappi is one of my favorite fun pasta shapes but again, any similar shape will do. If you’re like me, you probably have no less than 7 half full boxes of pasta in your pantry, no need to buy another, one of those will suffice! The spice can easily be left out too (just omit the harissa paste) or amped up for you spice lovers (add a bit more). It’s an adaptable hearty dish perfect for the cold first few weeks of spring! 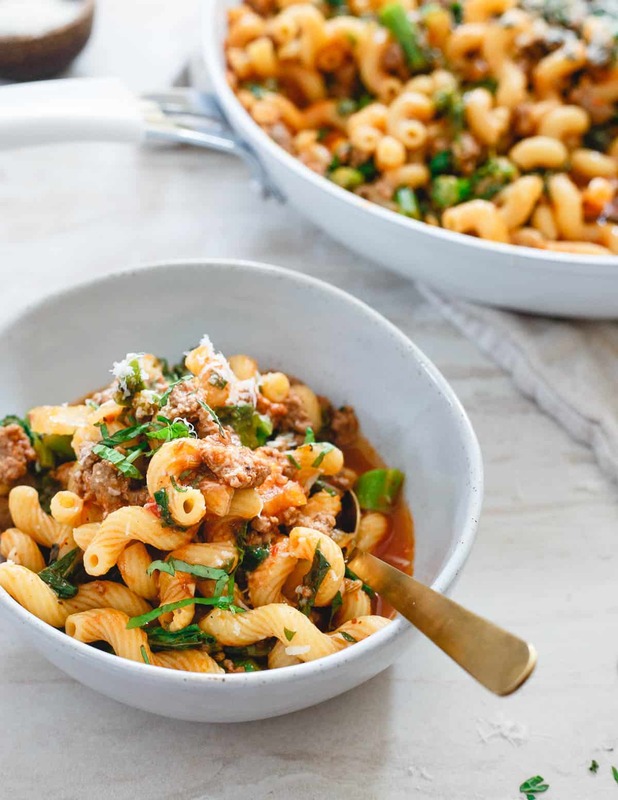 Love this spicy skillet lamb ragu recipe? Try these other skillet recipes: Turkey Skillet Mac and Cheese, Creamy Skillet Turmeric Chicken with Chickpeas, and Smoky Steak Potato and Pepper Skillet. Add olive oil and lamb to a large skillet over medium-high heat. Break up the lamb into small pieces as it cooks. Cook until browned. You can drain some of the fat out of the pan at this point if desired or leave it, up to you. Add the cumin, coriander, fennel seeds, smoked paprika, salt and pepper and stir to combine with the lamb. Add the onion, garlic and thyme, stir again and cook until onion is softened, about 3 minutes. Add the harissa paste and tomato paste, stir until incorporated and cook 1 minute. Add the broth, crushed tomatoes and broccoli rabe. Stir again until combined. Cover the skillet and let cook until broccoli rabe is fork tender, about 5 minutes. Add the cooked pasta to the skillet, stir to combine and heat through. Garnish with freshly chopped mint, basil and grated parmesan cheese before serving. Looks SO good! love this recipe! This sounds so so delicious! I need some of this in my life! I love how you used lamb in this! It’s not my usual go-to for this type of recipe, but it definitely works. And I want spring to arrive soon too… OMG. I am OBSESSED with lamb! I can’t wait to try this! I’m so over the snow too…ugh. Loving this lamb ragu though!! I never thought about buying American lamb, but you bring up a very good point! I’ll have to pay more attention at my grocery store. I can’t wait to try this recipe! The Spring Gyros also look delicious. Love lamb! This looks so comforting. Hope it warms up for you soon! Hi, can this be coooked in. Crockpot? Please advise. I have not tried it in the slow cooker but I’m sure you could adapt the recipe to do so. Looks like a healthy and delicious pasta recipe. Thanks for your helpful instruction. Love this recipe. Can you please include the nutritional information along with your recipes? It will make it so much easier for those tracking protein, fat, carbs. Thank you!